As we head into the winter season, there are so many fun activities for you to experience in Pagosa Springs. 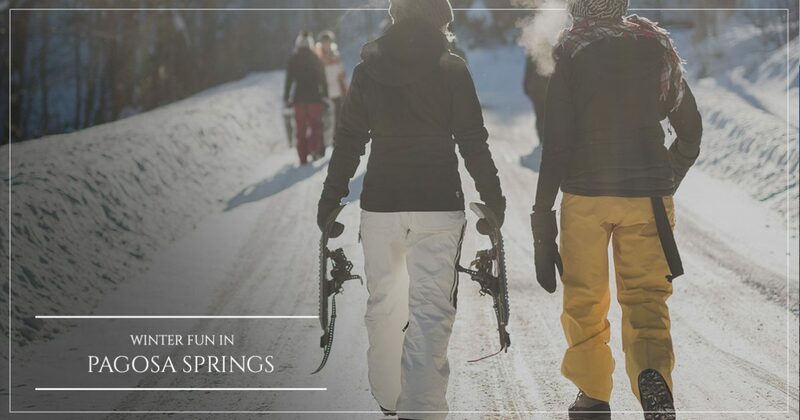 From adrenaline-fueled downhill skiing, to ice fishing and snowshoeing, you are sure to find something that fits your speed. Even if you prefer to simply enjoy the view from your spot indoors, curled up by the fireplace, we can probably tempt you to venture outside with at least one of the activities we’ll look at today. Continue reading our post, and then being planning your visit to Pagosa Springs. If your visit makes you decide to call this place home, then contact Galles Properties today and learn how we can help. If you enjoy the snow and cold, but don’t necessarily want to embrace the speed and adrenaline rush of downhill skiing or snowboarding, then you should consider trying cross-country skiing or snowshoeing. 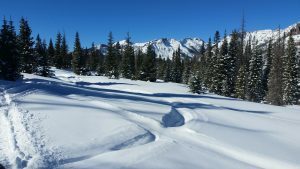 Choosing to cross the snow in the backcountry using either of these two methods allows you to experience the beauty of this pristine country. Take advantage of the 50 kilometers of groomed trails that are free to use, as well as dog- and family-friendly. If you are a little more experienced, then you should check out the Coyote Hill Nordic Loops. Do you remember the thrill of sitting on a sled and then shooting down a hill at what felt like lightning speed? Well, if you still want to experience the rush of cold air on your face as you sled down a hill, then be sure to rent a sled and choose the nearest hill in Pagosa Springs! Free local favorites include Reservoir Hill and the parking area near Lobo Overlook. If tubing is something you want to try, then be sure to head over to High Country Tubing Park and enjoy tubing down one of the four lanes that are open Wednesday through Sunday. Your entry fee also includes the tube rental. Of course, no trip to Pagosa Springs would be complete without a chance to luxuriate in the very springs for which the town is named. In fact, soaking in the hot springs would be the perfect prescription for the stiff joints and chilly bones you may be experiencing after all of the fun you had playing in the snow. The waters are naturally rich in minerals, which will help to soothe any tired and achy muscles that you might be experiencing. Depending on your preferences, you might want to enjoy soaking in an outdoor hot tub, or an indoor European-style bath facility. With 23 different pools to choose from, you might just spend all your time enjoying the relaxing and healing waters of the hot springs! At Galles Properties, we know firsthand how much Pagosa Springs has to offer! Whether you visit in the coldest part of the winter or the warmest part of the summer, you are sure to find an abundance of different activities to enjoy. Contact our team today and let us know how we can help you find your Colorado mountain home.